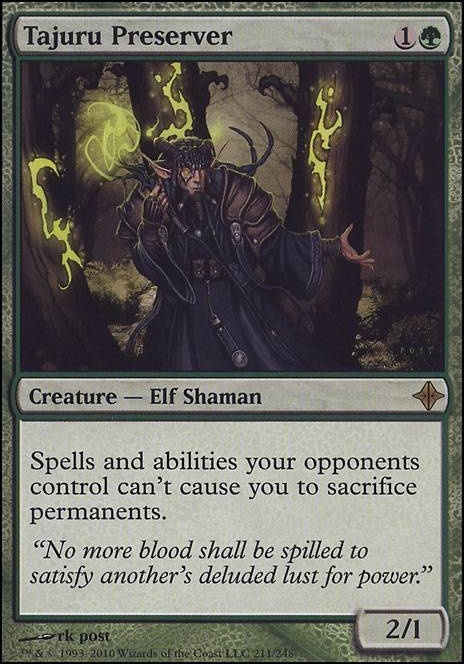 What is the interaction between Remorseless Punishment and Platinum Emperion? Ever consider Chord of Calling ? You can bring anything out at instant speed straight to the field. 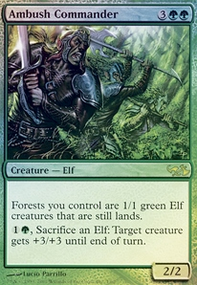 Like Spike Weaver , Tajuru Preserver , even the bae Yeva, Nature's Herald for anything else. As Pieguy396 and pskinn01 have said the (previous) controller of Tajuru Preserver would also have to sacrifice creatures. The important interaction is that Tajuru Preserver has a static ability that applies at all times when it is on the battlefield, and Butcher of Malakir has a triggered ability that goes on the stack and has to wait to resolve. Therefore; Tajuru Preserver is not on the battlefield and is protecting nothing when the sacrifices are to be made. Assuming the Preserver and the Butcher are controlled by two different players, I'm actually pretty sure it works the other way. The Tajuru Preserver only protects your stuff if it's on the battlefield when you would sacrifice the creatures. If it's destroyed by an ability that also destroys other creatures, it's in the graveyard by the time Butcher of Malakir 's abilities resolve, so you still have to sac creatures. 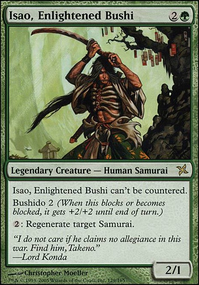 How does Tajuru Preserver and Butcher of Malakir interact if they both die at the same time? I activated Lord Windgrace 's -11, targeted Tajuru Preserver , Butcher of Malakir , and 3 creatures the Butcher player controls. It started a debate whether or not the Preserver's controller was still protected on not. We decided to just call the game a draw because it was 1:30am and we were all too tired to deal with it. i would remove Tajuru Preserver too. its not flexible enough. 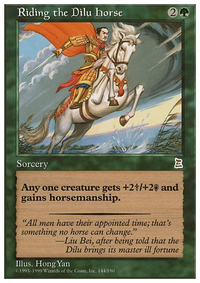 Natural Order is a great card but dont forget it will only find you a green card, so no Deadeye Navigator for example. Thank you for the suggestions. I love the idea of the Isochron Scepter . I feel that a good trade off for that card would be Tajuru Preserver . 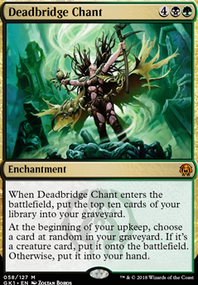 It's a card that is great utility but doesn't produce enough value in this deck. I will update that. I love the idea of Tooth and Nail in this deck, but I feel it may be a little too high of a CMC. I know that sounds crazy since this is filled with Mana ramp, but in most games and playtests, I never get to a point where that kind of Mana is available. I've thought about running Natural Order to achieve a similar effect, and it's a lower CMC. I find myself with 4 open mana frequently, and I could easily turn that into a Protean Hulk . Now the Palinchron + Phantasmal Image combo interests me BIG TIME. My only issue is that it would require me to either cut redundancy or protection. But the value produced seems fitting albeit a little "win more" flavored. But hey, that's a combo for ya'.